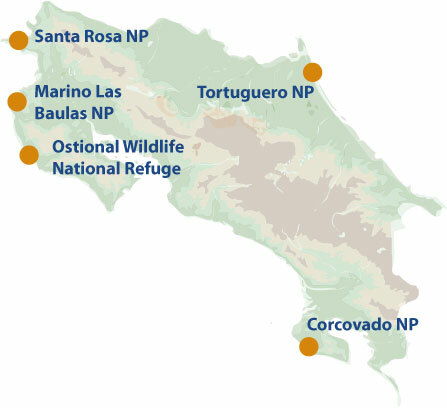 Costa Rican beaches on both the Caribbean and Pacific play host to turtles, be it leatherback, loggerhead, hawksbill or olive ridley turtles. They return to their birthplace to lay their own eggs as the circle of life continues. If you time it right, you may see the little hatchlings emerge from their nests and make a beeline for the shore. A beautiful sight to behold. The enormous leatherback is the largest of all turtles. The average adult weighs in at a staggering 270 to 360 kg and will grow between 1.5 and 1.8 metres in length. It takes its name from the smooth, tough leathery skin they have in place of a shell. Of all turtles, the leatherback has a largest range and they are known to inhabit the Pacific, Indian and Atlantic Oceans. Despite conservation efforts their numbers are declining – whilst Costa Rica makes every effort to protect their nests and limit human interference when they are on land, they are often caught up in commercial fishing equipment such as nets and lines. This has led to them being classed as ‘Vulnerable’ on the IUCN Red List. Smaller than leatherback turtles, but still pretty impressive, are the loggerhead turtles, growing up to 1.2 metres in length and weighing 180kg. They have a large head (hence the name) and strong jaw, much of their diet consists of crabs and whelks. Their range is almost as large as the leatherback and they are found in every ocean. They are also declining in numbers, mainly as a result of getting caught up in commercial fishing nets and lines. They are listed as ‘Endangered’ on the IUCN Red List. The hawksbill turtle has the most beautiful shell, marked with intricate patterns. Adult hawksbills weigh in at 45-90kg and will grow to approximately 0.5 to 1 metre in length. They are found in the Atlantic, Indian and Pacific oceans. They feed mainly on sponges and often inhabit coral reefs, mangroves and rocky areas. Once hunted to near extension for their shells, numbers have increased slightly since a ban on turtle products was introduced. Hawksbills are ‘Critically Endangered’ on the IUCN Red List. The olive ridley turtles, named after their pale green shell, are the smallest you are likely to see in Costa Rica, and the most common. They weigh between 35-45 kgs and grow to about 0.6 metres. They will come ashore in large numbers to nest and it’s quite a sight to behold. It is thought that these mass nestings coincide with weather patterns and the moon cycle. Despite what may look like healthy numbers, these turtles are listed as ‘Vulnerable’ on the IUCN Red List.